Are you a musician? An artist? A photographer? Or are you an entrepreneur setting up a business? No matter what you do, a website builder can come to your rescue! It is a marketing tool that has the ability to shape your business and success. But there are hundreds of website builders out there. How do you know which one is right for you? 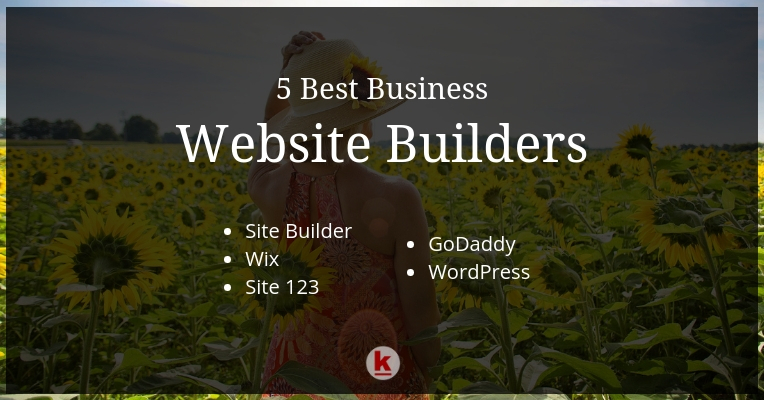 Lucky for you, we’ve put together a list of websites builders out of which you can select which one is most suited to your business. SiteBuilder is a reputable business website builder with many users. It is one of the inexpensive website builders when you consider all the others that are available. Since the templates are simple and easy to use it is considered one of the best user-friendly website builders, especially for people who have no experience building a website. If you’re looking for a great deal, they’re offering a 50% off for the first term! Site Builder also allows you to have a free domain name. The support team is extremely helpful with their quick responses. The best part about WiX.com is its wide range of templates. With so many options to choose from, you will be able to make a website that suits all your requirements. Since it uses the DIY platform, you can retain your signature style. Its platform is hosted and it allows you to have full access to the WiX app market. WiX also has excellent e-commerce features, which you can make more interesting with its discounts features etc. Site123 is ready to go! 1, 2, 3, GO! Yes, this is a site where you can rearrange pages or posts in a matter of just a few minutes. It has readymade templates on a wide range of topics. These templates are beautiful and very easy to use, making site123 one of the best user-friendly website builders available. If you are looking to build an e-commerce website, this is an excellent option for you since they have great service support for e-commerce. Their basic plan pricing for a year is quite inexpensive and it comes with a free domain name! GoDaddy is an interesting website builder because it gives you a free trial for a month so you can figure out whether it’s the right platform for you to build your website on. It is easy to use and similar to other website builders. GoDaddy also uses a drag and drop editor to create a website. For beginners, WordPress is not very convenient to use. Yet, it is one of the most widely used website builders but it is mainly used by those who have some experience building websites. This is one builder that allows you to have your online store free of charge. They call this service Woo commerce. It provides a well-designed open-source technology. For paid users, they have the assistance of a representative. These are some of the features that make WordPress one of the best business website builders. Overall, their service is not expensive for what it can do. Additionally, the reviews say that it gives you 100% uptime. The best thing one can do before selecting a website builder is to know your own requirements and budget, and then look for a website builder that can deliver the same. After all the homework, if you still feel unsure, make good use of the free trial option. As we wrap up the article, we hope we made it easier for you to select a suitable website builder for your business or venture. If you still think it’s complicated and find it much easier for someone else to make your website, we could help you! Already have a business website? Get a free audit report! Liked this article? Sign up for our monthly newsletter! Wordpress is my favourite one !!! I know all of them but never tried them. I prefer to build a website from scratch. Wix is so easy to use, highly recommend. A few years ago, GoDaddy was the number one website builder but I prefer Wordpress. Just what I needed for my business, thank you.